London is home to many Tudor manor houses, Georgian country estates and neo-classical mansions. If you are intrigued by their history and fancy exploring them for yourself, why not participate in one of the National Trust’s guided tours? Today we will share with you four of our favourite National Trust properties based in London. Sutton House is a Tudor building found at the heart of East London. It was built all the way back in 1535 by Sir Ralph Sadleir. Although the home has had some alterations over the years, it still retains many original features including oak-panelled rooms, carved fireplaces and a courtyard. After you have explored the beautiful property, you can head onto the charming tearoom to quench your thirst. There is also a lovely little second-hand bookshop you can visit, as well as a shop stocking a range of National Trust goods and gifts. Entry costs just £3.50 for adults and £1.00 for children. Family tickets and group tickets are also available to purchase. Heading to Hackney? Why not visit Sutton House? Ham House was built in the 17th century and is located alongside the River Thames. It is an impressive building that has a rich history. The building’s design was the vision of Elizabeth Murray, Countess of Dysart. Over centuries Ham House has survived war, fashion and neglect, but is still standing strong today. Many people view the house as being quite mysterious, with some visitors even claiming that it is haunted! Throughout the year the National Trust hosts many ghost walks at Ham House and they also put on a special Halloween event in October. Once you have explored the house and grounds, head onto the Orangery Café where you can indulge in homemade soups, sandwiches and salads all of which are made with fresh local produce. Eastbury Manor House is a stunning Elizabethan merchant’s house and gardens. It is a Grade I listed building which is now owned by the National Trust and managed by the London Borough of Barking and Dagenham. It was built in 1573 and retains most of its original features today such as its exposed timbers in the attic, spiral oak staircase and soaring chimneys. There are parts however which decayed over time and the house is missing one of its two octagonal stair turrets. Luckily the National Trust purchased it in 1918 or it would have most likely faced demolition! The atmospheric building really tells the story of its past occupants. If you fancy a day out with your family, you are sure to love the National Trusts costumed guides. Whilst exploring the building on the tour, you will also learn about its colourful history. Today the stables at Osterley House have been converted into a fully-functional tea room. Today the house still looks as it did in the 1780s and you are welcomed into it like you are one of the family’s guests. Once you have explored the house, be sure to stroll through the beautiful gardens which have been re-stored back to their 18th century looks, with herbaceous borders, roses and vegetable beds. There is also a tea-room in the stables where you can treat yourself to a cup of tea and a slice of homemade cake. If you fancy doing a little wildlife spotting before you go home, head over the Middle Lake, where you will also find the forgotten boathouse. Although these four National Trust properties are truly magnificent, they are not the only historical houses to visit in London. 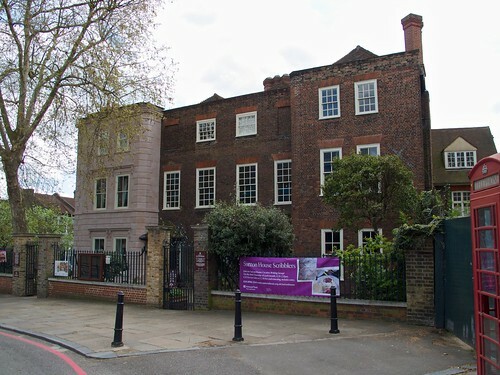 Make sure that you also take a trip to Carlyle’s House in Chelsea, Fenton House in Hampstead and 2 Willow Road in Hampstead.